When Social Security was enacted in 1935, retirement age was set at 65 and people lived an average of 3 _ years more. People looked forward to receiving social security and pensions and spending their later years with hobbies, leisure activities, family time, travel and perhaps some volunteer work. They had worked hard all their lives and now looked forward to winding down and reaping the rewards of their hard work. That was old paradigm. That was also back in the time that people stayed in one job, one industry, and often worked for only one company during their work life. Since the beginning of the 20th century, approximately 30 years have been added to our lifespan and these years have been added to the middle - not the end of life. I am a collector of quotes. In their concise, imaginative, lyrical, or profound way they summarize the "truths" of our lives and our natures in a way that hits us square in the face. They package insightful wisdom in short, easy to remember, phrases that rest lightly in our minds and yet can catalyze new ideas and actions. Oliver Wendell Holmes Jr., in commenting upon the power of ideas noted, "The mind, once stretched by a new idea, never regains its original dimensions." At the core of every repeat sale or product upgrade is a satisfied customer, the ultimate driver of most successful business ventures. Satisfied customers turn into loyal customers who buy more software and services and recommend and promote your offerings to other prospects. Conversely, businesses whose software products and post-sales service continually fall short of meeting customer needs - and repeatedly register low customer satisfaction - will eventually go out of business. In addition to providing a high quality product or service, one of the most strategic ways to increase end-customer satisfaction is to develop and leverage effective channel and alliance partnerships to deliver high quality service both during and after the initial sale. Diane, as a WITI Member, submitted this article to WITI for publication. Do you have expertise to share? WITI gladly accepts submissions for publication! For more information or to make a submission, please visit the Members' Area. Denise Houseberg, president of MarketExpo.com, is one of three Dallas finalists in the Make Mine A $Million contest. The contest is funded and sponsored by American Express OPEN, Count-Me-In.org and The Women's Leadership Exchange. For the next year, Denise will receive funding, mentoring and coaching to ensure that MarketExpo.com gets to a million dollars in sales. Launched in 1999, MarketExpo.com provides a gateway between the manufacturer and the consumer online. Most manufacturers offer a much larger line of products than represented at retail. Limited shelf space in the traditional retail store prohibits any one store from carrying all lines. To resolve the age-old dilemma of satisfying consumer demand, Denise came up with MarketExpo.com as a way to give consumers access to manufacturers' entire line of products without jeopardizing their relationship with brick-and-mortar retailers. Now representing 22 manufacturers and 11,000 products, Marketexpo.com sells a variety of home and garden products. Featured Business: Jeanne Bynum Hipes, Esq. 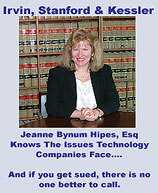 Jeanne Bynum Hipes, Esq., former Assistant General Counsel to one of the world's largest technology corporations, and now Of Counsel to Irvin, Stanford & Kessler, LLP in Atlanta, Georgia, is dedicated to providing excellent legal services to technology companies. Call her on 404-364-4541. A seasoned trial lawyer, Jeanne practiced complex, commercial litigation in the Atlanta area for many years before joining Lockheed Martin Corporation in Owego, New York in 2001 to serve as the company's Assistant General Counsel. At Lockheed Martin, Jeanne gained valuable national and international business and negotiating experience handling legal issues connected with the development, production and sale of cutting edge technology, while concurrently overseeing and directing some of the nation's top outside counsel in employment-related and business litigation. As an attorney with Irvin, Stanford and Kessler, Jeanne uses her courtroom experience to resolve disputes as quickly and advantageously as possible, using aggressive litigation strategies, negotiation, mediation, arbitration, and jury resolution. Jeanne's unique blend of experience in both the world of litigation and in the national and international business world enables her to understand the business perspective of commercial clients, while fighting aggressively for their concerns in the litigation arena. This experience also enables her to structure contracts for her clients that avoid litigation. Jeanne handles matters involving trade secrets, employment agreements, noncompete/nondisclosure/nonsolicitation agreements, business and technology contracts, business torts, employer duty, securities issues, RICO, products liability law, insurance, UCC, and other business issues. Jeanne has conducted arbitrations before the NASD and AAA, and has litigated in numerous judicial forums throughout the United States, as well as in foreign jurisdictions. In the next 5 years, the Internet will no longer be the easy, low cost alternative. It's going mainstream. So you have a choice; listen to wannabe Internet guru's selling you water by the river, or take the steps to insure your success. In addition to regular feature articles, employee profiles, job search tools, reminders and resources for finding a job at Intel each newsletter also has three different Success Through Diversity feature articles. You can sign up for one, two, or all three. Our feature articles focus on different community groups at Intel such as: African Americans at Intel, Latinos at Intel and Women in Technology at Intel. This position has responsibility for primary contact between Nordson and assigned customers, will provide installation supervision/technical support for the designated PPA Focus Market systems, and develop new technologies for applications as required based upon field application, customer and field engineering needs.